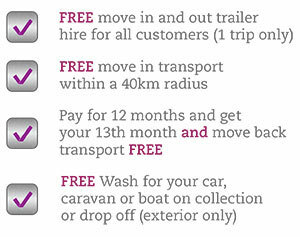 Free move in transport for a 40km radius, dependant on the volume of goods we have a truck for larger loads or free trailer rental for smaller requirements. Booking is essential, please contact our office for more information. All packaging supplies are for sale on site, buy individual items or one of our packaging kits. For an additional nominal fee these can be delivered on request. All padlocks for your units are for sale at our store. Rental periods are from one week as long as you like, adding more flexibility and not tying you down to a long term contract. Please note that there are additional rental costs attached to this service, call our service agent for more information.